The solar system might be a lot hairier than we thought. A new study publishing this week in the Astrophysical Journal by Gary Prézeau of NASA's Jet Propulsion Laboratory, Pasadena, California, proposes the existence of long filaments of dark matter, or "hairs." 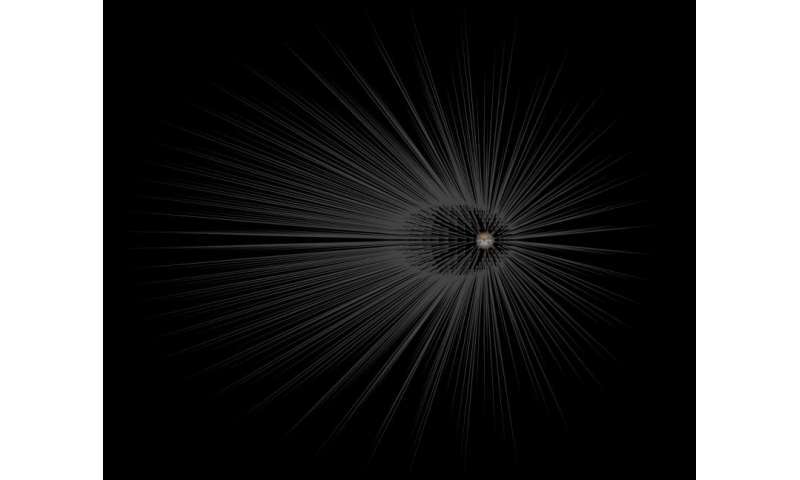 Hairs emerging from planets have both "roots," the densest concentration of dark matter particles in the hair, and "tips," where the hair ends. When particles of a dark matter stream pass through Earth's core, they focus at the "root" of a hair, where the density of the particles is about a billion times more than average. The root of such a hair should be around 600,000 miles (1 million kilometers) away from the surface, or twice as far as the moon. The stream particles that graze Earth's surface will form the tip of the hair, about twice as far from Earth as the hair's root. "Dark matter has eluded all attempts at direct detection for over 30 years. The roots of dark matter hairs would be an attractive place to look, given how dense they are thought to be," said Charles Lawrence, chief scientist for JPL's astronomy, physics and technology directorate. Another fascinating finding from these computer simulations is that the changes in density found inside our planet - from the inner core, to the outer core, to the mantle to the crust - would be reflected in the hairs. The hairs would have "kinks" in them that correspond to the transitions between the different layers of Earth. These DM guys mays change the fundamental constants, make up hairy Solar system and still be considered Science!? Somehow, gps operates as if there were no dark matter and all our satellites and probes somehow compensate so well that we never detect the dark matter. There is no apparent limit to the B. S. dark matter can generate. Oh wow, what a potentially fantastic way to detect planets in the future. It will change a lot about how the universe is mapped and explored. Assuming the violent creator of the ever-cynical, hateful, moon-howlers wasn't so sloppy that gravity is different for us on earth than it is for the galaxies, because what a hack. So that is where the 'mad comb-over' Donald Trump's hair on his shiny top went to?! Stanford University Professor Leonard Susskind, The Father of String/M-Theory lectures and writes extensively and accessibly for the public. so-called super strings are not related to string theory. I've always thought that if the branes of string theory are true, and we indeed do live in one of many dimensions. Then maybe, just maybe, this dark matter is actually gravitational bleed through from neighbouring branes. As gravity is considerably weaker that it should be, and it is hypothesised that it is spread across all the dimensions, where as electro magnetic energy is contained within its unique branes. There have been LHC experiments a few upgrades back looking for mini black holes and other dimensions that didn't turn up anything, but the idea is back since the LHC is even more powerful than ever. So they may find some yet. Wow. A hairy solution to a hairy problem. All you'll get are more questions about gravity, since DM does not exist. "dark matter" is just another term for a discrepancy in the quantitization of fields. I think a filamentary description (foam, etc.) is as valid as any in resolving the discrepancy. And that it has stretch and or, velocity and direction, (tensor), doesn't bother me. I hope CERN will continue to operate at higher energies and focus more on the present-day "Higgs observations," for if it is not true, and that the Higgs Boson does not exist, would be the greatest scientific blunder in human history, on scale with the flat Earth. Also, it would be fantastic to see more CP Violation, and broken Higgs symmetries, and/or other scalar fields not yet known. I appreciate, greatly, diverse scientific views and think this publication is fantastic, and requires some bravery in reading the comments here: 50% want conventional science, the other 50% want their own theories. So, if this so called dark matter is forming 'strings', perhaps the question to ask is "What is the mass of a magnetic field with it's strings and filaments and field effects?" So much of the stuff that so called 'real' scientists with their bashing their heads against the walls trying to figure out where this Missing Mass is, when, if one drops those preconceived notions of Dark Matter and look at the tons of properly done experiments and data, reproducible and properly done as per scientific methodology, that shows that Magnetic Fields and plasmas over immense distances, including between galaxies and having been proven to propagate along lines of the Cosmic Superstructures, where the magnetic fields have been measured and mapped, yet some think it impossible that magnetic and electric flow via plasma can happen on a relatively small area of a single galaxy to form full magnetic shells. DM proponents keep disproving their own theory and prove the EU theory For us, such fun. "EU?" Is this an "Electromagnetic Universe?" Is it EU vs. DM, now? Seems plausible along lines of sight, but where is the description and quantitization of this field and/or particle (links online: so that we could all learn of the cosmological theory)? It seems like a foamy universe, to me—with "field lines," and a certain amount of coherence. What are the properties and characteristics of the elementary particle (and/or field) that is rendering this coherence? Before the matter is the spirit which give reason to the matter existence. Dark matter is another name of misunderstanding of materialist in science. The matter which is dissolved in the structure of the vacuum of space moves with a resistance in it by analogy to the movement of electrons in the crystal lattice of conductors. This resistance gives mass to the particles. I think we just need to accelerate a beeping laboratory satellite past the solar system for a hundred years, and take careful measurements. That would help a lot, but all our measurements would still be form the past and Pioneer is rather doing that, but there are still large uncertainties. Very learned complicated by speculation, without scientific basis. The first misconception is, the formation of galaxies. Stars forming galaxy. There is no a galaxy without stars. There's no point in being obtuse about this. Nobody is jumping up and down screaming that this is "the answer". It's just an interesting product of math in a computer simulation. IF (caps on purpose) we imagine that the computer simulation is correct, it's still of very little real use. IF, and that's a really really big if, the computer simulation actually describes how dark matter behaves around a planet, consider the following (assuming dark matter is real): The hairs wouldn't be following our planet around, we would leave them behind as soon as they formed, as we travel in our spiral around the sun and through the Milkyway. So, you wouldn't be looking for 'hairs' at twice the distance to the moon. You'd be looking for them in a trail behind the Earth. Most of the time, we'd be encountering new, virgin dark matter that hasn't been stretched into hair structures yet, as we travel through space on our planet. Lets get Metaphysical for a second. I know its frowned upon here but I will keep it short. If you lived in a virtual world inside a computer and were trying to figure out how your universe works and what controls the physics. Would hardware and software controlling your universe look or seem anything like the Dark matter and Dark energy we know influences our universe? Something similar happens with moving electric charges around points or wires connected to an electric potential. The field of the points/wires, if of opposite sign wrt. the charges, bends and focuses the charge beams, before they fly on divergent paths. So the described effect is not strange at all if one supposes there are beams of particles that interact gravitationally only. This effect offers a huge chance of checking the DM assumptions, which I think should make happy those opposing DM. Frequency, redshift, time dilation; that type of stuff. There's no point in being obtuse about this. Straight to the point then, instead of sarcasm. DM was invoked because of the discrepancy between galactic rotation curves that are observed vs. calculated, based on the same equations used to describe the motions in the solar system. The equations of motion describing the planetary orbits work on this scale and were derived prior to DM hypothesis. Adding a DM component to the solar system and keeping the math of motion correct would yield a completely different constant for G, and would render all previous equations that have been used to successfully describe this motion incorrect. You need to be careful about bringing up for discussion the sciences of Kepler, Newton & Einstein that have been proven time & again to be correct. The consensus scientist in pop-sci these days, & on this site, is the godfather of DM, alias Zwickey (that'll get the the popo-sci crowd here goin'). 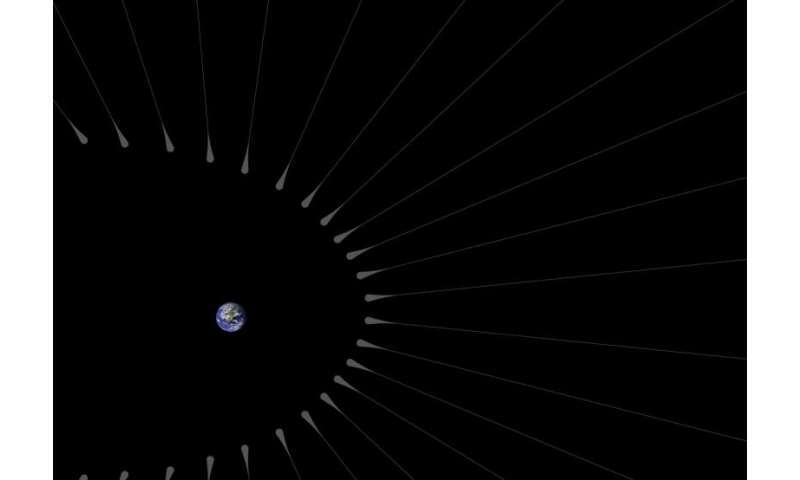 Most of the time, we'd be encountering new, virgin dark matter that hasn't been stretched into hair structures yet, as we travel through space on our planet. And how would you know this as well? What you have proposed needs a means of detection. Are you privy to a DM Detector none of the rest of us know about? The guy in this article wants to add an awful lot of mass to the solar system that wasn't accounted for in the equations of our 3 friends above. The particle DM proponents do not appear to consider ALL of the ramifications of their hypotheses, and apparently neither do the peer reviewers when they give stuff like this a nod of approval. So dead on the money right. All this ducking dodging & weaving with all these "filaments" selectively finding places to hide inside Zwicky's original DM Envelope are simply a sideshow to get around Einstein's calculations for gravitational lensing as starlight passes the immediate peripheral disc of our Sun. The DM godfather at least had the common sense to keep DM as far from our Sun as possible, simply because he knew it interfered with Einstein's calculations for gravitational lensing in GR that was published 20 years previously. These days so many GR illiterates abound, it's the reason this site is filled with so much trash talk. Looks like gravitational waves (predicted by Einstein). And the theory is debated all day......."
There is a 100% chance that the International Space Station is Full Dark matter, so much so, that the Astronauts can probably smell the stuff. Looks like Faraday's Lies of Force to me. We should come up with a cubesat experiment to look for dark matter and have the howlers pay for it. "The guy in this article wants to add an awful lot of mass to the solar system "
Nope. He's only saying that the tiny bit of DM that is supposed to be around organises in hairs. DM was invoked because of the discrepancy between galactic rotation curves that are observed vs. calculated, based on the same equations used to describe the motions in the solar system. And in elliptical galaxies. So we know these equations to work at large scales. The equations of motion describing the planetary orbits work on this scale and were derived prior to DM hypothesis. and would render all previous equations that have been used to successfully describe this motion incorrect. It is a viable theory and you do not have an alternative. Back to the drawing board, bs. According to Newton everything you say is wrong.